Now you’ll probably have to excuse my bias here as being a professional goalkeeper coach of course my view may be a little bit one sided but let me put forward my views anyway. So what is a goalkeeper coach worth to your team? Well if you think that a good keeper can save you 10-15 points a season it’s the difference between winning titles and a relegation dogfight! Good keepers are worth their weight in gold and if you get one you certainly try to keep hold of them, but why then would you not have someone there to specifically improve them, keepers need to be tested daily to keep themselves sharp and only a keeper coach can do that for you. Don’t expect your keeper to stay in top form if he is neglected, left to train by himself or with his understudy while you work on overlapping full backs or attacking crosses. 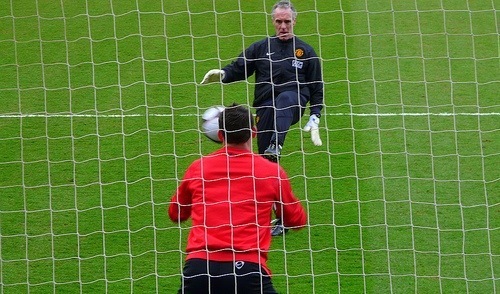 Keepers have not only got a physically demanding position that requires specific training not just having to stand in a coconut shy, but also a mentally demanding position that needs a coach who can put an arm round the shoulder, talk through the mistakes, the confidence dips, the torment of the position. As a manager can you afford the time to do that for your keepers as well as 16 outfielders? I’d say it would be tough to, so why not employ a keeper coach to do it for you? Someone who understands the keeper and the psychology that goes hand in hand with the position. I’d say you can’t afford not too. Budget is tight? Then spending a little less on strikers or flair midfielders, and a little on helping your keeper could be the difference between promotion and relegation. Think about it. Help your keeper, help you team, gain more points, win more prizes, keep your job longer. Everybody is happy. Wishing you clean sheets and happiness, until next time. A big thank you to David for this. Check out his blog for more great posts like these at: http://degkcoach.wordpress.com.